This is the story of two brothers who seek to bring honor to their family name, though their shortcomings prove damaging. Over time, one has become deemed as “the good brother;” the other “the bad brother.” When looking back at the lives of Edwin and John Wilkes Booth, it is clear as to which brother earns what title. However, prior to the assassination of Abraham Lincoln, the distinction is not so clear. Edwin was born to the famed eccentric actor Junius Brutus Booth. Although quiet and scholarly, Edwin decides to follow in his father’s theatrical footsteps and gradually develops his acting skills. Soon Edwin finds himself playing lead roles and being favorably compared to the great Junius Brutus. However, acting isn’t all that Edwin picks up from his father. Junius struggles with alcoholism, sometimes performing on stage raving drunk. Despite watching his father succumb to alcohol time and time again, Edwin begins to drink himself. He too starts appearing on stage under the influence. John Wilkes was born five years after Edwin and immediately becomes the darling favorite of his parents. He is lovable, rambunctious, and although he tends to be rash and reckless in his behavior, great things are expected of him as he too enters the world of acting. Trying to step out of his father and brother’s shadows, John, through his energetic performances and striking good looks, quickly becomes one of the most popular actors of the mid-1800s. By the late 1850s, as the country divides over the issue of slavery, so does the Booth family. Edwin is loyal to the Union; John Wilkes favors the South. Over the course of the war, John grows to despise Lincoln and views him as a tyrant. By the war’s end in 1865, John’s hatred of the President has grown into an obsession. Wishing to be a hero like the Shakespearean characters that he plays on stage, John assassinates Lincoln at Ford’s Theatre hoping to achieve lasting glory. However, his deed does not make him a hero, but a villain to both the North and South. Eventually, he is caught and killed. 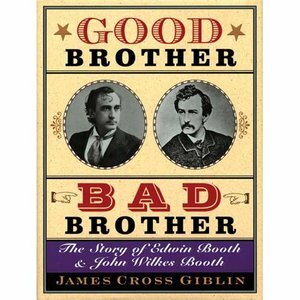 Good Brother, Bad Brother: the story of Edwin Booth & John Wilkes Booth by James Cross Giblin is a wonderfully written and illustrated story which reveals the life and thoughts of two brothers who in their imperfect ways took part in shaping the nation.